As a parent, you want the best for your child, especially when you are away from them. For this reason, many parents have a difficult time choosing a daycare or learning center that checks every box on their list of needs. From a qualified teaching staff to a safe and welcoming environment for your little one, there are many variables that can determine whether or not your child will flourish while attending a learning center. 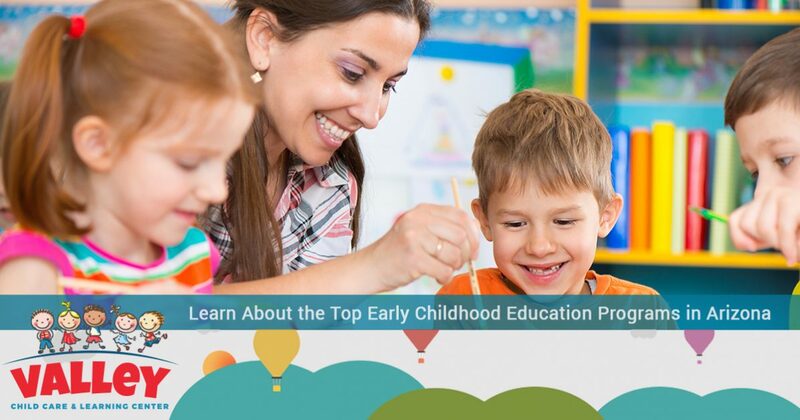 In today’s article, we will be taking a closer look at each of our early childhood education programs in Arizona, so that you can get a better feel for what to expect while sending your child to Valley Child Care and Learning Centers. Since 1967, Valley Child Care and Learning Centers has provided the leading daycare services to residents of Arizona. With 10 unique locations in areas such as Tempe, Surprise, Anthem, and Phoenix, we make it easy to find high-quality, affordable childcare services in your area. We know that your child’s safety is of utmost importance, which is why we run extensive background checks on all of our employees and equip each of our learning facilities with a number of security cameras. If you are interested in learning more about each of our early childhood education programs, continue reading more on the topic below. Your child’s earliest years play a vital role in shaping who they grow into as a person. At Valley Child Care and Learning Centers, we understand this and work incredibly hard to ensure that your little one is provided with the degree of care that he or she deserves. From exciting music classes designed to stimulate and develop the auditory system to hands-on items that are used to refine your little one’s motor skills, we offer the tools and attention that your child needs to grow into a happy and healthy toddler. The toddler program at Valley Child Care and Learning Center is designed to bring children together so that they can practice and continue to develop their social and cognitive abilities. This is accomplished through reading, group sharing, and a number of other immersive activities to get your child engaged with his or her peers. If you are wanting to effectively prepare your child for kindergarten, there is no better way to do so than by enrolling your little one in Valley Child Care and Learning Centers’ preschool program. We offer a number of fun activities for children to take part in throughout the day including outdoor play, reading time, art, and so much more! We know that your busy schedule can sometimes conflict with your child’s schooling. That’s why we offer before and after-school programs for children to take part in where they can participate in arts and crafts, receive help with their homework, and burn off excess energy by playing outdoors! These are just some of the many services that we offer at Valley Child Care and Learning Centers. If you are interested in touring one of our 10 unique facilities, contact our team of friendly professionals today to learn more!